Figure 1. 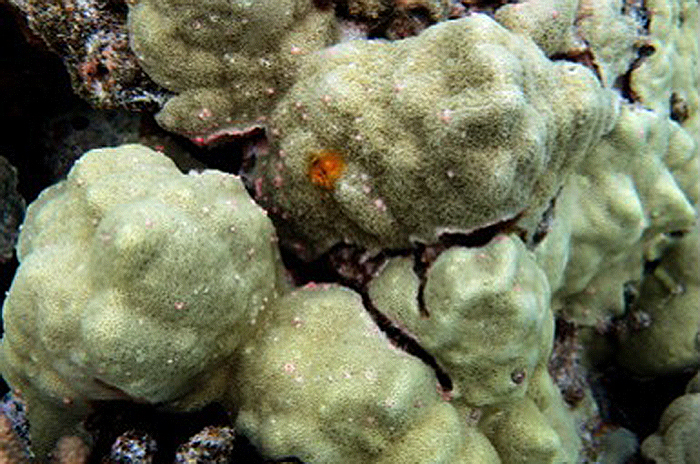 Porites corals are very common in Hawaii, and are often the predominant coral in shallow water. This article is a follow-up to an article published here earlier this year (2013), and will examine the light intensity requirements of zooxanthellae in a coral commonly found in shallow water – the ‘Mound Coral’ (Porites lobata). These corals are not particularly attractive and are often displayed for their colonies of Christmas Tree worms (Spirobranchus spp.) but they are hardy in captivity and offer relatively flat surfaces for various optical analyses required during my experiments. Before continuing, I will offer a glossary of terms used within this article and recap information reported in the previous article. GlossaryClade: A group of things (such as zooxanthellae) sharing a common ancestor. Genetic fingerprinting of zooxanthellae has identified a number of species, and many sub-species called ‘clades’. Pacific Porites specimens often contain Clade C15 zooxanthellae. Other common zooxanthellae clades, found in other corals, are A, B, and D. There are hundreds of clades divided among major groupings and some corals may contain more than one zooxanthellae clade at a time. Further research has shown various clades to possess certain traits. Clades C1 and C3 are called ‘generalists’ because they are found in many coral species. Other clades (‘specialists’) may be found in exclusively in only one or two coral species. Corals stressed by heat may contain Clade D. Not surprisingly, tolerance of light intensity differs among zooxanthellae clades. The zooxanthellae clade(s) found within a coral colony can go a long way in deciding which reef zone(s) is best suited for that particular coral (although other factors are certainly involved). Yield (Photosynthetic): The ratio of absorbed light particles (photons) to the number of electrons moving through a photosystem, determined by measuring chlorophyll fluorescence. Yields of zooxanthellae are generally lower than those of green plants (i.e., 0.40 to 0.80). Electron Transport Rate (ETR): Photons (particles of light) are collected by photopigments and then move through the photosynthetic process as electrons. The number of electrons moving through this process is called the Electron Transport Rate, or ETR. Technically, this flow of electrons is reported as ‘µmol electrons·m²·sec’. The Electron Transport rate is calculated by multiplying the Yield (see definition above) by Light Intensity (PPFD, or PAR value). Since light absorbed was not measured, the ETR reported here is considered to Relative ETR, or rETR. Photosynthetically Active Radiation or PAR: Radiation (either natural or artificially created) that falls within the range of 400 nanometers to 700 nanometers (violet to red light). 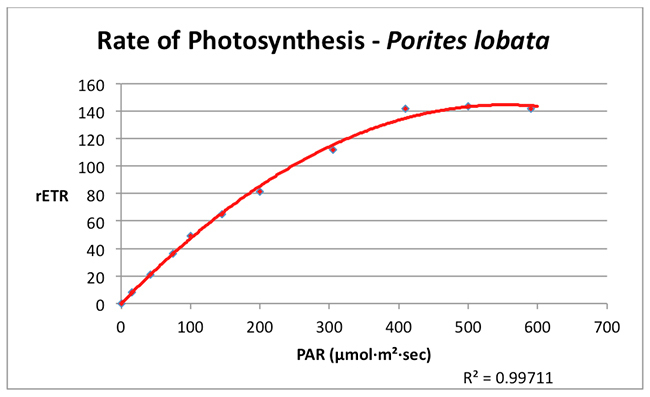 It is reported as ‘µmol photons·m²·sec.’ Photosynthesis/Irradiance (P/I) Curve: A P/I curve shows the relationship of photosynthesis and irradiance (light intensity). PPFD, or Photosynthetic Photon Flux Density: The number of photons (light particles) falling a given surface area in a given amount of time. PAM Fluorometer, or Pulse Amplitude Modulation Fluorometer: A device capable of measuring chlorophyll fluorescence (mainly in Photosystem II) and determines the kinetics of photosynthesis. Saturation Point: The rate of photosynthesis is proportional to light intensity only to a certain point. The saturation point has been reached when increased light does not increase the rate of photosynthesis. Dynamic Photoinhibition: This phenomenon is a natural, protective response to high light intensity by plants, algae, and zooxanthellae. Light energy converts xanthophylls from one form to another (in this case, diadinoxanthin to diatoxanthin) thus protecting the photosynthetic apparatus and preventing (or at least delaying) damage to the zooxanthellae that has to be repaired (if this sort of damage occurs, it is known as Chronic Photoinhibition). The Photosynthesis ‘Pressure Relief Valve’ – The Xanthophyll Cycle: Zooxanthellae (as well as many plants) have a protective pathway in place called the ‘Xanthophyll Cycle’. In zooxanthellae, two xanthophylls are involved: Diadinoxanthin and Diatoxanthin. These protect the photosynthetic apparatus in two ways: Blue light is absorbed by diadinoxanthin and diatoxanthin, thus preventing its absorption by chlorophyll or antennae photopigments. In the second photoprotective measure, diadinoxanthin is converted to diatoxanthin by pH shifts in the thylakoid lumen caused by absorption of light. In darkness, the cycle reverses and diatoxanthin reverts to diadinoxanthin. There are various other names for this naturally occurring process – phycologists (those who study algae) call it Non-Photochemical Quenching (or NPQ), while others call it ‘Dynamic Photoinhibition’. Whatever the name, this xanthophyll cycle offers protection against high intensity light. However, the protection offered is not unlimited. When all diadinoxanthin is converted, the cycle offers no further protection. Determination of light intensity requirements of zooxanthellae can be determined by a number of methods. Early data were generated through use of respirometers and, while these are still used, the instrument of choice today is a PAM (pulse amplitude modulated) fluorometer. This device measures the fluorescence of chlorophyll and hence can estimate the rate of photosynthesis as well as how absorbed light is diverted from the photochemical process. In essence, the PAM fluorometer is a ‘photosynthesis meter’ and can estimate the amount of light required by symbiotic algae. This is reported as ‘rETR’ (relative Electron Transport Rate, since photons absorbed by chlorophyll and antennae pigments move through the photosystems as electrons). Results and Discussion The first work involved the stony coral Pocillopora damicornis and results of those experiments found the zooxanthellae in this coral reached saturation (maximum photosynthesis) at only ~200 µmol·m²·sec¹. Photosynthesis in this shallow water Porites lobata reached a maximum rate (the saturation point) at a PAR value of about 350 µmol·m²·sec¹. No dynamic photoinhibition was noted at the maximum PAR value used in the experiment (590 µmol·m²·sec¹). Figure 3. A Photosynthesis/Irradiance Curve demonstrating the rate of photosynthesis (rETR, for Relative Electron Transport Rate) at various light intensities (PAR, in units of µmol·m²·sec¹). Many hobbyists cling to the notion that corals and their symbiotic algae require intense lighting and some have responded by illuminating their aquaria with high-wattage lamps. The results of these experiments indicate that a shallow water coral (Porites lobata) tolerates intense lighting but does not require it (as mentioned previous experiments found the zooxanthellae of another tidepool coral (Pocillopora damicornis) reached photosaturation at ~200 µmol·m²·sec¹). The survival strategies for these corals (and their respective zooxanthellae clades) are clear – endure high light intensity but remain able to exploit low light intensity during times of low light levels. Obviously, there could be many reasons for low light such as cloudy weather (see Figure 4), rough surf entraining air bubbles in the water column, turbidity caused by runoff containing suspended matter, light-absorbing dissolved matter in the water, and others. 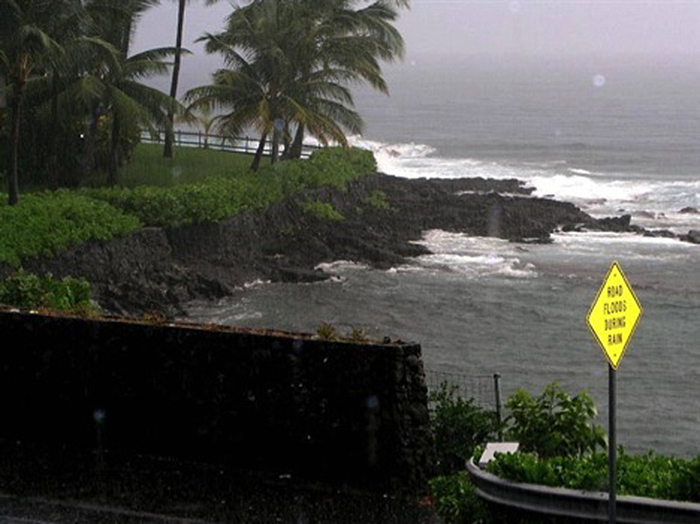 Not-so-obvious reasons include things such as light attenuation caused by volcanic smoke (a common occurrence on the west side of the Big island of Hawaii). These data demonstrate zooxanthellae clades originating from different ancestral clades have evolved similar photosynthetic capacities. 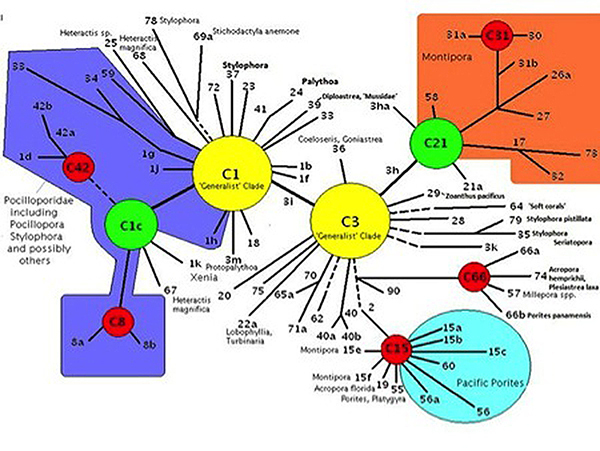 Porites lobata is known to contain clade C15 (ancestral clade is C3) while Hawaiian Pocillopora damicorniscontain various clades originating from the ‘generalist’ clade C1. (See Figure 2). In the cases of both corals mentioned above, good growth will be noted at low light intensities in aquaria lighted by common sources (metal halides, fluorescent lamps, LEDs, etc.). Given the light levels produced by any of these sources, over-lighting would be relatively easy and could resort in stunted coral growths and unnecessarily high aquarium operational costs. An interesting question arises – why would these coral species populate such a hostile environment? We can speculate that the coral planulae found the proper chemical cues for settlement (likely specific calcareous algae species and/or biofilms) within cracks or under ledges. These microenvironments suggested the place was proper for settlement. Figure 4. Don’t be fooled by the travel brochures – It is not unusual for cloudy and rainy weather to last for weeks at a time in Hawaii. Corals must survive extended periods of low light. Experimental Protocol Small fragments of a Porites lobata colony were collected from a shallow tidepool and, within hours, sectioned into smaller sections with a tile saw. PAM experiments proceeded after the fragments had healed (a few days). The PAM fluorometer operates on the following principles. Chlorophyll, the main photopigment found in zooxanthellae (and other plants and algae) gathers light and fluoresces it in the red portion of the spectrum (this can be seen with many algae in an aquarium when viewed under a black light). In order to measure photosynthetic parameters, minimum and maximum fluorescence must be determined. This is done after the coral is held in darkness for about 30 minutes and all Photosystem II reaction centers are ‘open’. The PAM meter I use is a ‘Junior-PAM’ made by Heinz Walz GmbH, Effeltrich, Germany along with their WinControl software. When using this meter, a blue LED supplies a minimum amount of light (a few µmol photons·m²·sec) and minimum fluorescence is determined. Then, a saturating pulse of blue light (10,000 µmol photons·m²·sec) is applied, which ‘closes’ all reaction centers, and maximum fluorescence is recorded. This is where I modify the manufacturer’s procedure. Instead of using the blue LED with a limited number of preprogrammed PPFD intensities, I substitute another light source (in this case a fixture containing blue and white LEDs manufactured by Build My LED) and measure the light intensity with a quantum meter (Apogee Instruments, Logan, Utah). When in the ‘sunlight’ mode, this meter’s measurements compare favorably to a ‘laboratory-grade’ quantum meter made by Li-Cor Biosciences (Lincoln, Nebraska). Light intensity from the LEDs is incrementally increased by adjusting the intensity via a rheostat or lowering the lamp. The coral/zooxanthellae are allowed to acclimate to the new light field for 15-20 minutes. Another saturating pulse of blue LED light is applied, and the WinControl software does the necessary calculations and records the data. This data is then downloaded to an Excel spreadsheet for further analyses. Acknowledgement Many thanks to Nick Klaus of Build My LED for supplying the LED lighting fixture used in this experiment.